WAIST HIGH: Dancing Around Our Handbags. Electronic duo Blancmange will reissue their three studio albums Happy Families, Mange Tout, and Believe You Me on Sept. 1 in remastered and expanded editions. 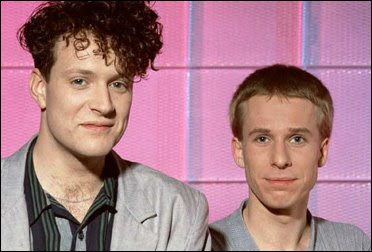 Neil Arthur and Stephen Luscombe first achieved success with "the 1982 minor hit single, 'Feel Me.' Later that year they broke through with 'Living on the Ceiling,' which reached #7 in the UK Singles Chart. Their debut album Happy Families also reached the top 30. "Further hits followed with 'Waves,' 'Blind Vision,' 'That's Love That It Is,' and 'Don't Tell Me,' all of which reached the top 40. Mange Tout reached the top 10. In 1984, Blancmange covered ABBA's single 'The Day Before You Came,' which reached #22 in the UK (higher than Abba's original less than two years earlier)." Additional Waist High favorites from Mange Tout include "Game Above My Head," and "See the Train." Mange Tout's full album title is Mange Tout (Dancing Around Our Handbags). Blancmange formally split up in 1987. "As stated on the band's official MySpace page, Blancmange have recently reformed and are writing material for a new album."